The Cleveland Indians are suddenly the busiest team in baseball. One day after pulling off a three-team trade to re-acquire Carlos Santana and ship out Edwin Encarnacion, the Indians pulled off another trade. 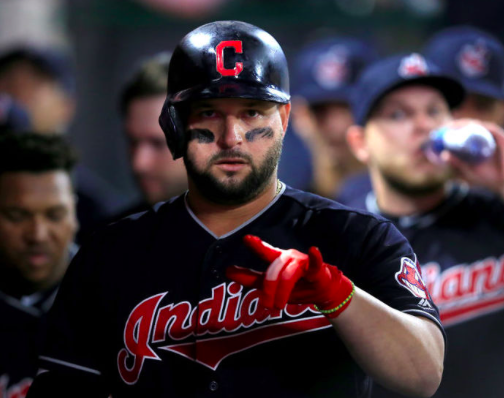 Late Friday night, the Tribe sent first baseman Yonder Alonso to the Chicago White Sox. In return, the Indians will receive outfield prospect Alex Call. With the Indians acquiring both Santana and Jake Bauers from Tampa Bay on Thursday, Alonso’s presence became superfluous. Rather than forcing Santana to play third base or the outfield, the Indians chose to trade away Alonso. That will allow Santana and Bauers to split time between first base and the DH spot next season. Of course, Cleveland’s over-crowded situation has turned into Chicago’s gain. The White Sox will become Alonso’s fifth team in less than five years. However, he’s moved around a lot because he’s become a valuable commodity. After years of failing to deliver on his raw power, Alonso finally had a breakout season in 2017, hitting 28 home runs. He signed with Cleveland last offseason and proceeded to hit .250 with 23 home runs, producing an OPS of .738. With the White Sox, Alonso figures to step in right away as the team’s primary first baseman. However, he will also share time at both first base and the DH spot with Jose Abreu. Those two will be expected to provide most of the power in Chicago’s lineup next season, as will outfielder Daniel Palka, who may also see time in the DH role. The act of acquiring Alonso signals that the White Sox are trying to push forward their rebuilding effort. Alonso is under team control for two more seasons, so he was brought in to help the White Sox win now. With a few other young players like Tim Anderson and Yoan Moncada starting to establish themselves, the pieces are starting to fall into place for the White Sox. It’s also worth mentioning that Alonso is the brother-in-law of Manny Machado. The White Sox are looking like surprise contenders in the sweepstakes to sign Machado, as well as Bryce Harper this offseason. Whether that family connection could sway Machado remains to be seen. However, it could be something to consider when Machado makes his decision. Even if they don’t end up with Machado, adding Alonso is definitely a step forward for the White Sox. Chicago is likely another year away from becoming a serious contender in the AL Central. But Alonso gives them a proven major league hitter and makes them a better team. As for Cleveland, trading Alonso took care of their logjam at first base. However, it doesn’t seem the like the Indians are anywhere close to finished making moves this offseason.